Samsung has just launched the Samsung Galaxy A80 which boasts three-camera selfie power thanks to a rotating camera array, but it looks like Huawei is interested in the idea too judging by new patents from the company. The patents, filed in China and picked up by TechSmarti, show three front snappers nestled in a chunky notch over the screen's display, as well as several sketches that show different ways a three-camera rear setup could be arranged. What are we expecting in the iPhone 11? What camera loadout will the OnePlus 7 have? In the image showing the front of the device, a home button can be seen – this doesn't mean Huawei is planning to bring back physical buttons, as it could just be a way of indicating where the in-screen fingerprint scanner is, or just a stock 'smartphone' sketch used simply to contextualize the location of the top notch. 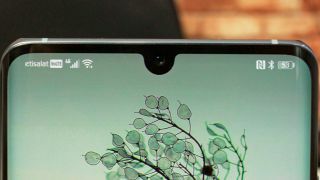 It's the rear camera images that have us questioning the patent though – while some of them show designs similar to other Huawei devices, in particular the Huawei P30, some of them look very different, which causes us to doubt the reliability of the patents. Huawei phones have traditionally had vertical camera arrays, both in the P and Mate series (although the Huawei Mate 20 had a square setup) – which means we'd be very surprised if the horizontal three snapper design came to be. Of course this could be the genesis of a new range of Huawei phones, but with the upcoming launch of the Huawei Mate X, the company likely has its plate full with phone launches for now. Companies often file many patents that never see the light of day, so we're not expecting to see phones that look like the patents any time soon, but you can check back to TechRadar for all the latest phones news and reviews anyway.